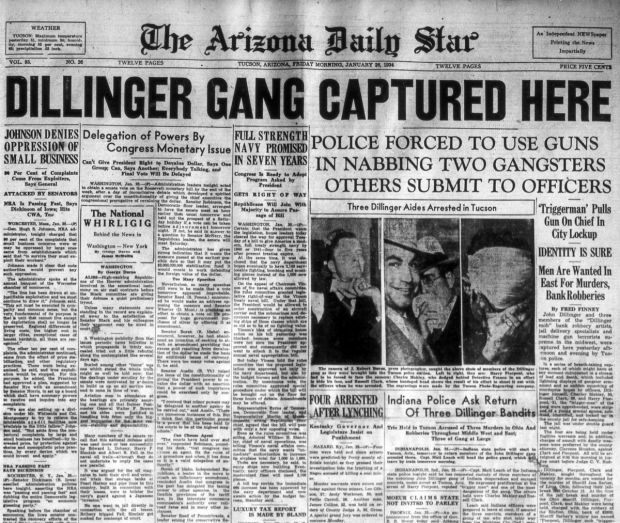 Arizona Daily Star front page on events surrounding the capture of John Dillinger and his gang in January, 1934. The men pictured, Harry Pierpont, Charles Makley and Russell Clark, were members of the Dillinger Gang. Not many people can say they live in the Dillinger House but people that actually live here can. I hope they have lots of house parties and tell all their friends the story of John Dillinger's capture. Alexandria Patterson and her younger sister Julianna, twirl and twist to the tunes of Desert Melodies, performing '20's and '30's era music in the Maynard's Beer Garden, just part of the festivities at the 2018 Dillinger Days, Saturday, January 20, 2018, Tucson, Ariz.
Sarah Carver delivers a telling blow to Buck Montgomery as the two perform during the reenactment of the Arrest of John Dillinger at Hotel Congress at the 2018 Dillinger Days, Saturday, January 20, 2018, Tucson, Ariz.
Bank-robbing celebrity gangster John Dillinger's only tie to Tucson is the fact that he got caught here. That's it. But that was enough to put Tucson on the map — and now Dillinger Days, which happens this weekend, is basically a Tucson holiday. You can blame that on the Hotel Congress. The hotel's history is entwined with Dillinger's; and in an attempt to keep the historic venue in downtown Tucson busy during the slow month of January — between New Year's and the gem show — 25 years ago the owners decided to bring back Tucson's favorite bad guy. John Dillinger, otherwise known as Public Enemy No. 1, was an outlaw from the midwest, best known for robbing banks and successfully escaping prison three times. They say prison changes a person and that's what it did to Dillinger. In prison, he met people who would later become part of his gang. And after his first escape, he become one of the most infamous robbers in the country with dead bodies and broken laws following him and his gang wherever they went. While the gang was ahead, they thought they'd stay low in Tucson where nothing could possibly go wrong. Originally, Dillinger and his gang were supposed to stay in a house on First Street and Second Avenue at 927 N. 2nd Ave., but apparently the floors had just been waxed or polished (or whatever), so they couldn't stay there that night. Instead, the gang stayed in a room on the third floor at Hotel Congress for the night. Unfortunately for Hotel Congress, a fire broke out in the basement, which traveled to, and burned down, the third floor. This flushed out the gang, leaving their bags of cash and guns in the rooms. They were screwed. I mean these guys were wanted by the FBI, their faces were on the front page of newspapers and magazines. Tucson police and firefighters accidentally did what the FBI couldn't. They arrested the gang but not John Dillinger, who apparently had slipped out during the commotion and run off to the house on Second Avenue. He was caught there hours later. It was the talk of the town. Tucson! The Dillinger gang was caught in Tucson (!) of all places. The arrest made headlines. We're really proud of that front page, it's hanging in a hallway at the Arizona Daily Star. "Dillinger Gang captured here" it screamed in bold font across the top. Dillinger and his gang were arrested and then later arraigned in the Pima County Courthouse before being extradited to other cities in the midwest for an actual trial. Dillinger went to Indiana and the rest to Ohio. The gang members, Harry Pierpont, Charles Makley and Russell Clark, were found guilty of murder. Clark served life in prison, while Makley and Pierpont were to face the death sentence. Makley died before getting to the electric chair while he and Pierpont attempted another jail escape. Pierpont died later on the electric chair. Dillinger, however, successfully escaped the "inescapable" Indiana prison he landed in using only a wooden gun, got a new gang together and went back to robbing banks. He did that for a little while until he was caught and killed by FBI agents outside the Biograph Theater in Chicago later that year. Hotel Congress, 311 E. Congress Street, now stands with only two floors. Around this time every year, it transforms into a 1930s time capsule filled with vintage cars, costumes, and Dillinger Gang capture reenactments. It kicks off with an exclusive speakeasy. What: Travel back to the 1930's at an exclusive speakeasy style party. You'll be able to partake in whiskey tasting, appetizers, live music, premium cigars, era related entertainment and historic fun. Cost: $40. Proceeds go to the Greater Tucson Fire Foundation to raise funds to help with training, technology, survivor's help, education campaigns, firefighter health and wellness and other support services. Info: This event sells out every year and is for the 21 and over set. Get your tickets here. What: This is a free family-friendly event that includes three Dillinger capture reenactments, historical artifacts exhibit, vintage car show, lectures, arts and crafts, vendors, walking tours of downtown, Hotel Congress tours, food trucks and the actual John Dillinger Tommy Gun on display. Reenactments take place at 11 a.m., 1:15 p.m. and 3:30 p.m. There will also be a beer and food garden at Mayards (just across the street) which will include food trucks and a beer trailer as well as a stage with live music. This event is free, but you can buy $30 tickets to get a front row seat during the reenactments while you enjoy brunch from Cup Cafe. Go here to get them. A version of this story was first published on This is Tucson last year. It has been updated to reflect this year's events. This one will take you back in time with its old-world charm and feel under a 550-seat big top tent and classic performances.